I don't know when the beta will end, but when it will happen, we will start putting currencies to bid for! About my guardian grade, i can't be promoted untill i will start writing guides again: i'm too lazy for that, right now. Hide 59 comments... Click to show. UsF wooot! Nice avatar btw. Thanks spm, btw congrtz on becoming Guardian! Which server do you play SF on? Why you guys think SF is that good? loool nah that is actually a glitch I believe.. ;) I just liked the game play especially playing competitively.. in tourneys.scrims.e.t.c . grtz finaaly we became the talented author!!! im back, and thanks sleepdady for teaching me how to bolden the words!! your doing great things here !!! The reward given depends on the quality of the work, so while your waiting for your coins, you could spruce up the work, maybe add a picture or check on the grammar. Anyways, im off for the night, talk to you tomorrow. Goodnight. You know you only get rewarded fan coins on each article you enter per week. Out of the 4 you`ve entered in that week, your only getting rewarded for one im pretty sure. Great dude...And now ur first..>! Good Job..! Congratz on the 3rd place mate and have a merry christmas! i still got 3 more guides to be approved and 2 frnds to join ! EVERYONE IS A BIRD! WOAHHH! Do you have any more guides to be approved? i do buy coins ? Do u know that : 60% of ur points should from submission of guides and stuff? dude i don't scam like others do so chill i wouldn't do that to earn Fancoins!!!! UsF fanup moderators will check you for multiple accounts. if you have signed up multlipe accounts for earn 200 coins for each account you will see your fan coins removed. thnks Nyleigram n austin blans!!! Hey! Welcome to FanUp! If you're havin problems with creating your avatar, try relogging and refreshing your browser. Hope this helps! Try this.. logout to fanup, then login after 5mins and now you can start to create your avatar. Then, every category like eyes, hair, body, etc.. save it first after you finish save again and click done. and logout your fanup to refresh. and login again after 5mins.Tell me if still not working. 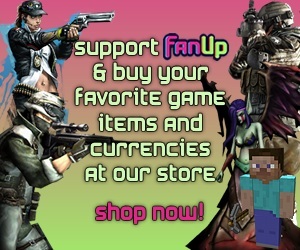 dude make an avatar and you'll get 100 fan coins.